Oscar season is upon us once again, so this week I’m featuring the most cocktail-friendly of the Best Picture Nominees- The Grand Budapest Hotel (DVD/Download)*. Wes Anderson’s charming adventure/caper features all the classic Anderson tropes- fabulous sets, fabulous costumes, refined characters, and beautiful storytelling. It’s a world that I want to step into, martini glass in hand, wry smile on my face. Whatever happens on Sunday night, I’m just glad that more people are talking about this delightful film. The Grand Budapest Hotel is about a resort hotel in the fictional European republic of Zubrowka (which incidentally is a Polish vodka brand) in the years between “The Great Wars”. M. Gustave is the concierge at this beautiful hotel, where he meets and –ahem- services Madame D. After her sudden death, he is bequeathed a valuable painting, but her family objects and charges M. Gustave with murder. The silky-tongued concierge must now escape from prison and make his way back to the Grand Budapest where the painting has been hidden. Helping him along is his trusted Lobby Boy, and the secret society of the Crossed Keys, a venerable who’s who of Anderson regulars. Ralph Fiennes is absolutely perfect as M. Gustave, playing the character as funny, charming, and desperate all at the same time. Of course I’m madly in love with the sets for the Grand Budapest Hotel, and wish I could check in for a two week break from reality. My cocktail this week references the famous painting in the film, the fictional “Boy With Apple”. I’m excited to use Calvados this week, which is a French apple brandy. Surely, M. Gustav would have sipped this on many occasions. 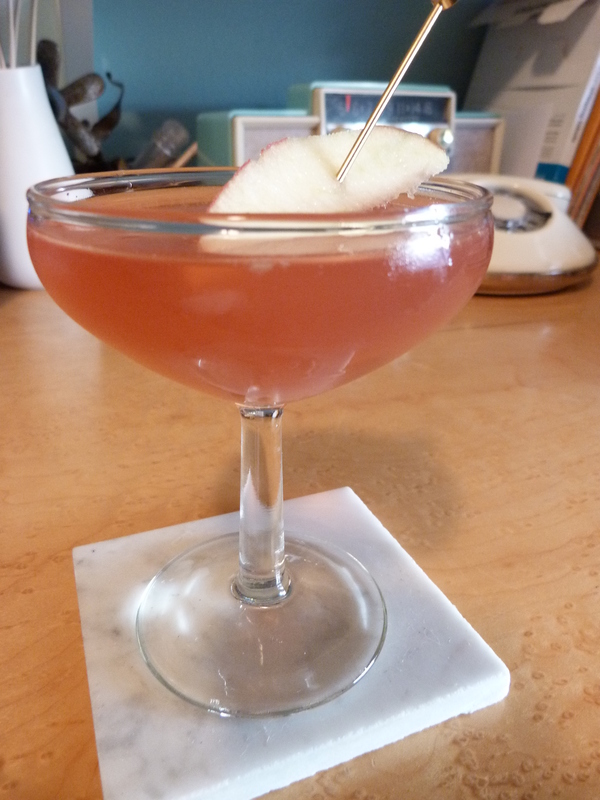 While watching The Grand Budapest Hotel, I recommend drinking a Grand Apple. Mix all ingredients except champagne in a cocktail shaker filled with ice. Strain into a coupe glass, and garnish with pink champagne and apple. The hue of this drink is not quite as pink as the Mendel’s boxes of confections in the film, but you get the idea. Because of the addition of pink champagne, this cocktail makes a great addition to your Oscar party this year. I know I’ll be sipping it during the telecast, and wishing I had a Lobby Boy to attend to my every need. Oh wait, isn’t that what they call a husband? 😉 Cheers! *note: While I love The Grand Budapest Hotel and think it’s a great movie to watch with a cocktail, I will actually be rooting for Boyhood this Sunday. I cannot say enough good things about this film, nor even put into words the impact it’s had on me. If you haven’t seen it, watch it. Then buy the book. 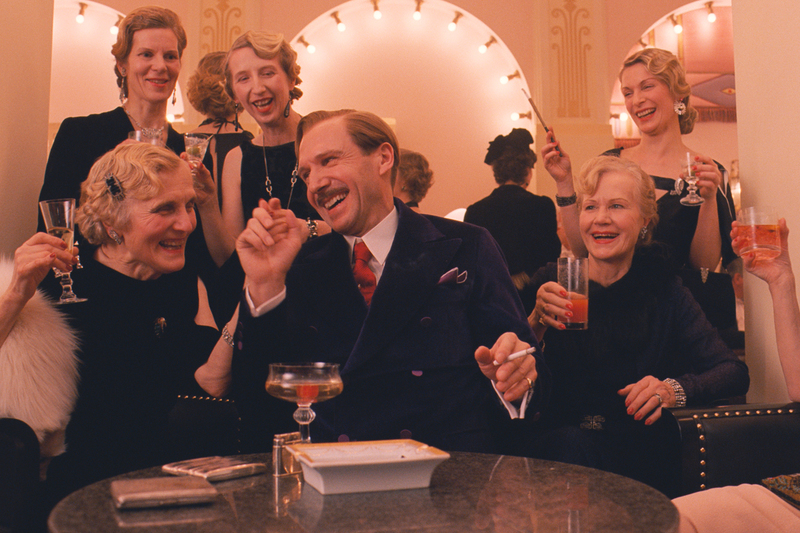 Posted in Comedies, Uncategorized and tagged Apple cocktail, Boy With Apple, Calvados, Grand Budapest Hotel, M. Gustave, Oscar cocktail, Pink Champagne cocktail, Ralph Fiennes, Wes Anderson. Bookmark the permalink.